IT EARNED its stripes as one of Scotland’s top celebrity eateries, with an eclectic menu which has attracted stars including Tom Hanks and Gwen Stefani. Now culinary trendsetter Maison Bleue has launched an exclusive new dish in Edinburgh, inspired by a delicacy among scattered tribes of Sahara camel herders. What really sets apart the Bedouin Méchoui Feast is the fact that it has to be ordered a whopping 24 HOURS in advance, to ensure it is cooked to perfection. Dean Gassabi, who founded the restaurant in 1998, has hired exotic belly dancers to unveil the new dish at a glittering launch party next week to celebrate a six figure refurbishment at the venue, which is a culinary institution in Edinburgh. He said: “We know our loyal customers and we are sure they will be more than willing to place their orders for this special dish a full day in advance – It’s definitely worth the waiting time. “To mark our refurbishment we wanted to give our customers a completely new and unique experience, a standout new dish on the menu. “When we were looking for inspiration at first we weren’t sure about the Bedouin Méchoui Feast, because of the time involved. “However, the taste and texture is fantastic and having to order 24 hours in advance adds to the whole experience of savouring it properly. quarter of lamb fit for four or more diners. 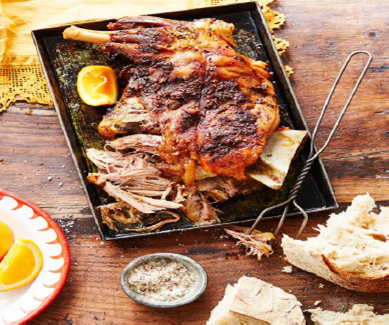 In the cuisine of Northern Africa, Méchoui is a whole sheep or a lamb spit-roasted on a barbecue. It is a dish inspired by the Bedouin desert nomads of North Africa – typically goat and camel herders – who lovingly preparing the meal which is often served up as a special wedding celebration delicacy. At Maison Bleue the dish will be served with an assortment of North African salads, couscous or the renowned Maison-Bleue side pommes chateaux. Since launching in 1998 Maison Bleue’s fusion of North African, French and Scottish cuisine has made it a firm favourite with diners and critics, while its location on historic and cobbled Victoria Street, just off the Royal Mile, makes it popular with tourists. It is not the first time Dean and his team have brought a new eating experience to diners in the Scottish capital, introducing a French tradition of small sharing plates when the restaurant launched. Dean added: “We introduced Les Bouchées, which is French for “mouthful” back in 1998. We single-handedly encouraged people to move away from the traditional way of eating with just starters followed by mains. “In fact, ‘the new way of eating’ was our slogan for a very long time, and what we meant by that was that we were offering French tapas-style sharing plates, which wasn’t available anywhere else in Edinburgh. Maison Bleue reopened after a month-long shut down which saw the three-storey, centuries-old venue stripped back to the stonework and everything replaced, including the tables, wallcovering, seating, lighting, crockery and mirrors and ornaments. The bohemian décor – including distressed wood, exposed stonework and a Marrakesh-inspired palette, combined with pink neon, delicately patterned Victorian side plates, North African tiles and mismatched seating – is every bit as eclectic as the menu. Staff and diners alike have been delighted with the transformation, which has seen the restaurant comprehensively reinvented from the floor up, yet still retains the distinctive feel of Maison Bleue. Hundreds of guests attended the venue for its official relaunch party on Tuesday (Apr 14), where the new dish was also unveiled. The restaurant prides itself on using the best and freshest Scottish produce and has long-term relationships with the finest Scottish suppliers. The 70-cover restaurant, which also has a 25-seat lounge and bar area, employs 30 staff and has traditionally undergone smaller updated every five years.